Thanks to the support of our generous donors, we have been able to support several of our patients through more intensive procedures and recovery, as well as support various public health and sustainability projects! Thank you for your support! Ruth’s surgery went very well! She is recovering and has begun her therapy to regain mobility of her elbow. You can see a video of Ruth back at home after her surgery here. 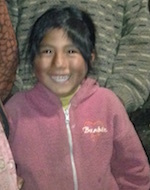 Ruth Karina is a six year old girl from Huasampata, Peru, located about one hour outside of Cusco, Peru. Currently, Ruth is in the second grade. She attends a local school, which she walks to every day with her siblings. Before her accident, Ruth was a very energetic and happy little girl who enjoyed playing with her siblings and friends outside. Since her accident, however, Ruth has become more reserved and withdrawn, and no longer likes to go out to play. Ruth came to one of Volunteers Around the World’s mobile clinics in May for a cold, when our Peru Medical Director, Dr. John Huamanquispe, noticed her elbow. buckets of water in a wheelbarrow back to the house for her family. The wheelbarrow she was pushing unexpectedly flipped over, causing Ruth to fall and land on her elbow, dislocating it. Ever since then, Ruth has had to live with the pain and discomfort of having a dislocated elbow which she is unable to use. Unfortunately, Ruth’s family is not able to afford the surgery to fix her elbow. When her family attended VAW’s mobile clinic and heard that Ruth might be able to receive surgery, they were very excited. Dr. Huamanquispe believes that Ruth has a very good chance of recovering near-full mobility of her elbow, because she is so young. He has already made contact with a local physical therapist who is willing donate his time and energy to Ruth post-surgery to aid her recovery. Please consider donating so that Ruth can have her elbow fixed, and return to playing and enjoying life as every six year old should be able to. Any amount will help! You can donate on Ruth’s Empowered page here and see photos of Ruth and her family here.